The United Kingdom formally opened a biogas processing site to provide for nearly all the energy needs for a nearby air force base. 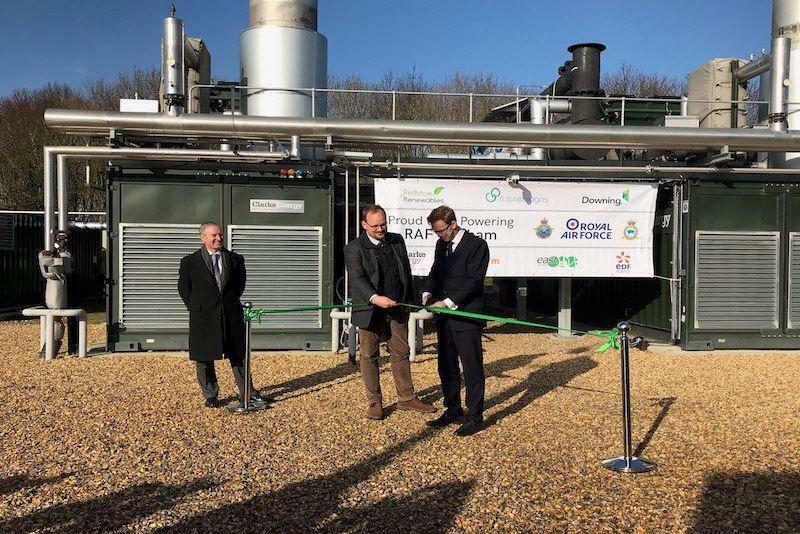 Defense Minister Tobias Ellwood ceremonially opened the facility, built and operated by Future Biogas, in Swaffham, England, on Thursday. The plant will make electricity from locally grown fermented crops to power RAF Marham, the air base where the Royal Air Force houses its F-35 and Tornado fighter planes. The base is the U.K.’s first to be powered by green energy, and is expected to deliver 4.5 megavolt amperes per day, or 95 percent of the needs of the air base. Ellwood said on Thursday that the installation will “lead the way” in dealing with climate change. “I hope that this plant can act as a model and we can see more sustainable energy schemes rolled out across other military bases,” Ellwood said. The plan to use biomass to make electricity to power the base will save the Ministry of Defense nearly $400,000 per year in electricity costs.